ST. LOUIS (AP) _ St. Louis leaders will give residents and businesses an opportunity to weigh in on whether the city should raise the minimum wage to $15 an hour. The city’s Board of Aldermen will hear public input during a meeting scheduled for 5:30 p.m. Tuesday at City Hall, a week after the city’s Ways and Means committee has heard testimony on a bill that would institute a $15 per-hour minimum wage by 2020, the St. Louis Post-Dispatch (http://bit.ly/1LnS81k ) reported. The state’s mandated rate is $7.65. The federal minimum wage has remained at $7.25 since 2009. As of Jan. 1, 29 states and Washington, D.C., had minimum wages higher than the federal standard. Some cities have also taken action. Los Angeles earlier this month became the biggest U.S. city to approve a phased increase to $15 an hour. 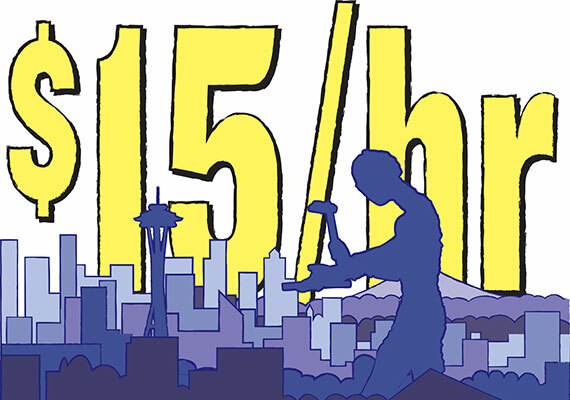 Last year, Seattle approved an increase that will eventually reach $15 an hour. Chicago and San Francisco have also upped the minimum wage. Alderman Joe Vaccaro said he suspects the bill will be altered in committee and that the $15 rate _ supported by St. Louis Mayor Francis Slay _ is more of a goal, though it may not be a reality. He said there could be a push to make the wage happen only if St. Louis County passes a similar measure, as was done with the city’s smoking ban. But St. Louis County has shown little interest in such a thing, and there would be a significant legal hurdle since the county may not have jurisdiction to force its 90-plus municipalities to comply. On the other side of the state, a Kansas City effort by faith-based, labor and social justice groups gathered nearly 4,000 signatures on a petition toward a ballot measure raising the minimum wage to $15 by 2020. The City Council decided not to put the measure on the Aug. 4 ballot after opposition from the business community.